More than 150 people were killed and hundreds wounded when a massive truck bomb ripped through Kabul's diplomatic quarter, bringing carnage to the streets of the Afghan capital and shattering windows hundreds of metres away. 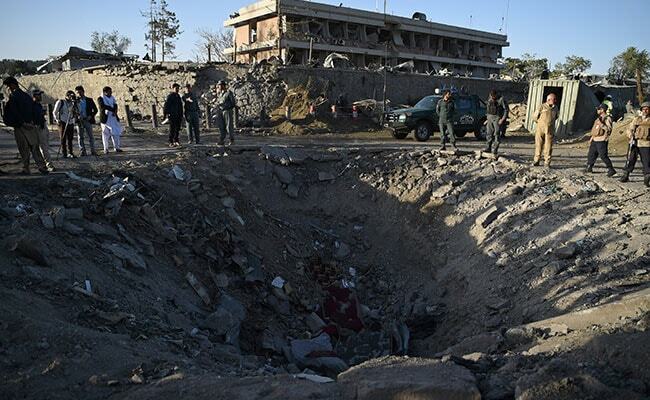 Afghan security forces and residents stand near crater left by truck bomb attack in Kabul. Kabul: The death toll from a devastating truck bomb in Kabul's diplomatic quarter last week has jumped to more than 150, President Ashraf Ghani told an international peace conference in the capital on Tuesday. "Over 150 innocent Afghan sons and daughters were killed and more than 300 wounded were brought to hospitals with burns and amputations," Ghani said. Previously officials had put the number of dead at 90. The protesters, holding a sit-in for a fifth day Tuesday near the bombing site, have demanded the resignation of Afghanistan's security chiefs, including national security adviser Hanif Atmar -- a demand that Ghani has turned down. And on Saturday, at least seven people were killed when suicide bombers tore through a row of mourners who were attending the funeral of one of the protesters, the son of an influential Afghan senator. No group has claimed the attacks, but the government has blamed the Taliban-allied Haqqani Network for Wednesday's bombing.